The Caspian Sea covers 371,000 square kilometers along the boundary between Europe and Asia. 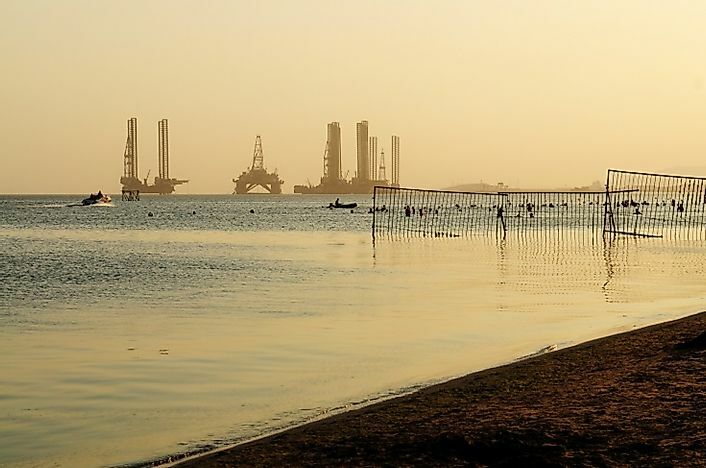 Oil extraction platforms in the Caspian Sea off of the coast of Azerbaijan. The Caspian Sea, the world’s largest enclosed, inland body of water, with an area of 386,400 square kilometers and a salinity of 1.2% concentration, is located between Europe and Asia. Five countries border the Caspian Sea. Namely, these are Russia and Azerbaijan to the northwest and west, respectively, Kazakhstan and Turkmenistan to the northeast and southeast, respectively, and Iran to the south. Currently, a large debate concerning the classification of the Caspian Sea is the subject of much geopolitical talk. The history of the Caspian Sea, such as the fact that it was linked to the Sea of Azov and the Black Sea sometime back in the geological time scale and currently still possesses brackish water in some parts and produces wave-like features, leads some to end up classifying it as a sea. On the other hand, the present truths that the Caspian Sea is completely landlocked on all sides and that it has freshwater towards its northern parts, especially near the mouth of the Volga River, deems it suitable to classify the Caspian Sea as a lake. Though apparently this classification does not appear to be anything but a geographical correction, there is a much deeper implication for the definition of the status of the Caspian Sea, which can significantly impact the economy of the countries bordering it. Such facts are explained further down in this article. As per geological estimates, the Caspian Sea was formed about 30 million years ago, and attained its current landlocked status some 5.5 million years back. The first humans inhabited this region as far back as 75,000 years ago. Major cities of ancient civilizations that grew up along the shores of the Caspian Sea included Hyrcania, Atil, and Tamisheh. The vast natural resources of the region allowed such ancient civilizations to flourish in the region. By the 16th Century, the presence of rich oil and natural gas resources in the area around Caspian Sea were already known to the Europeans, though this had less significance in the age before the internal combustion engine. The 18th Century marked the beginning of scientific explorations of the Caspian Sea, most notably those conducted under the direction of the Russian Tsar, Peter I the Great. In 1720 and again in 1731, the first major scientific reports on the sea were published. The early 20th Century expeditions led by Russian zoologist Nikolai M. Knipovich, led to a through in the elucidation of many multidisciplinary aspects concerning the Caspian Sea. Russian explorations and expeditions to the inland sea continued at a rapid pace thereafter until the break up and collapse of the Soviet Union in 1991. The Caspian Sea basin, especially its northeastern parts, is one of the most fossil fuel-enriched areas of the world in terms of its presence of oil and natural gas reserves. The sea has a potential deposit of oil and natural gas capable of generating nearly 79 billion barrels of oil and 7 trillion cubic meters of natural gas. Oil is extracted both from wells drilled on land and those offshore into the seabed. Oil and natural gas mining and export greatly benefit the economies of the countries bordering the Caspian Sea. Besides oil and natural gas resources, the Caspian Sea is also famous for its sturgeon fish populations. These Caspian sturgeons' eggs are use to make some of the finest varieties of the global delicacy known as caviar. In terms of fish for meat, four-fifths of the global sturgeon catch involves sturgeons landed from the Caspian Sea. The Caspian is also a famous vacationing spot for the people of countries bordering it, as well tourists from other parts of the globe. Cargo like petroleum, lumber, cereal grains, and sulfates are also transported via the Caspian Sea waterway between the countries lying across and around the sea. The vastness of the Caspian Sea is reflected in the climatic differences seen in different parts of the sea. While the northern parts experience a moderate continental climate, a subtropical climate prevails in the southern parts. Moreover, the eastern shore of the Caspian Sea experiences a desert climate. Though average summer temperatures from north to south range between 24 and 26° Celsius, average winter temperatures exhibit extremes in the northern part, being around −10° Celsius, while in the south they remain around a mild 10° Celsius. The eastern shores of the lake experience higher temperatures than elsewhere, reaching up to a maximum of 44° Celsius in the summers. Around 500 plant and 850 animal species thrive in the Caspian Sea's habitats. Tiny algae and diatoms constitute a huge percentage of the biomass of the sea. Arctic seals, Mediterranean seals, and the endemic Caspian seal, fishes like sturgeon, pike, and herring, and crabs, clams, and barnacles as well, all inhabit the waters of the Caspian Sea. Though environmental and ecological issues like overfishing, coastal desertification, water pollution from oil and natural gas drilling and industrial effluents, and sea-level fluctuations due to climate change continue to threaten the Caspian Sea, the threats from these sources can only be addressed if the countries sharing its water cooperate with one another to solve such issues. However, territorial disputes centered around the sharing of Caspian Sea and its resources among the bordering nations makes it nearly impossible to protect the sea from such dire environmental threats. The countries bordering the sea are in constant competition with each other, whether that be to access the sea for fishing, capturing its oil and natural gas resources, for using its waterways to connect to international waters, or otherwise. Here, the classification of the Caspian Sea as a lake or as a sea becomes vitally significant. If it is classified as a lake, then each of the five countries bordering it will be sharing one-fifth of the entire revenue generated by exploiting the natural resources of the lake. However, if it was classified as a sea, then countries would share its bounties based on the length of the coastline of each country along the Caspian Sea. Under such circumstances, Iran, with only 13% of the Caspian's shoreline, would suffer heavy losses. Currently, the absence of an agreement on the status of the Caspian Sea continues to create confusion and clashes between countries like Iran and Azerbaijan, as well as between Azerbaijan and Turkmenistan, and heavy losses to life and property are incurred quite frequently as tensions escalate into violence and sabotage. Which Countries Border the Caspian Sea?